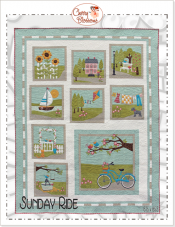 Enjoy a relaxing bike ride and the vibrant colors of spring with this fun applique quilt by Cherry Blossoms Quilting Studio. Finished size is 67.5"x85.5"
Wendy fell head over heels for this engaging, 76" x 90", primitive quilt designed by Joyce Weeks of Geoff's Mom Patterns. 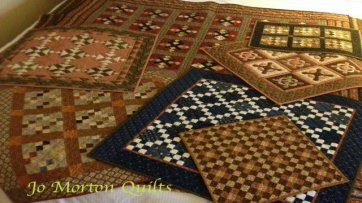 Sweet and Simple celebrates the quilter's life. 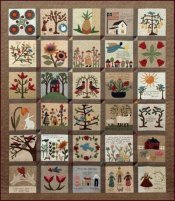 Laura Ingalls Wilder stated, "that the Sweet and Simple things of life are the most important after all." Come by and see Laura Kay, Wendy and Andree as they travel to Waco to join this fun one stop shop hop. Imagine visitng 31 shops all at one stop! 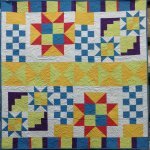 This basic paper piecing class will finally crack the mystery for you on how to successfully complete quilt blocks using paper. Sign Up Today! Our street might be closed but Happiness is...NOT! You can still access our parking lot via Hunt Street. It will be wonderful once completed...promise!